This was a weekend I will not forget. I drove a rental car 1,050 miles. I attended sixteen, yes sixteen, high school football games. And, I did it all in a span of four days. It would be four Wisconsin WIAA title games on Thursday, six Minnesota MSHSL semifinals on Friday, and six Minnesota MSHSL semifinals on Saturday. Sixteen games in 61 hours. This wasn’t just attending a sporting event. This was the decathlon of driving, sleeping, and watching football. Lots and lots of football. I hadn’t planned on this weekend. It was on Wednesday night in Illinois that I decided, ‘what the hell?’ and called to reserve a rental car for the next morning. At 7:30 local on Thursday the 18th, I was at Enterprise picking up a cherry red 2010 Dodger Avenger for the increasingly arduous journey. From my outpost across the Indiana line, I started driving out I-90 to Madison, Wisconsin. The first game was set to start at 10am and I was 190 miles away by the time I started driving. I knew I would miss the first half of the opening game. This would be my first time visiting Camp Randall Stadium in Madison. Personally, I would choose never to return. I arrived at the arena where parking was staged and waited for the shuttle. And waited, and waited. I was told it ran every 20 minutes. By the time I got on the shuttle and got to the stadium the game was just ending. I received a ticket to the second game for $8. The all day ticket was $15. I asked the teller and was told as long as I didn’t leave and reenter, I only had to pay $8. So, that works out to $2/game. Listening to the radio on the ride up and sitting at the parking lot, I got the gist that Gilman was just a strong team. Gilman was up 35-7, before scoring to make it 42-7 and invoking the mercy rule. On the last play of the game, Catholic Central scored a touchdown to make the score slightly less lopsided. The PAT was negated, and the final score stood Gilman 42, Burlington catholic Central 13. The Edgar Wildcats and St. Mary’s Springs Ledgers matched up in Division 6. In Wisconsin, the title games are played in order. D7 through D4 on Thursday, D3 to D1 on Friday. So, D3 gets a much worse start time than D4. And apparently, they’ve had this schedule for quite some time. Gilman wore Packers colors. Light green helmets, white jerseys, and light green pants. Yellow accents. Light green numbers. St. Mary’s Springs worse all Kentucky blue. White helmets, white numbers, and white stripes. This was the lowest scoring game of the weekend. Both teams were defending champions of D5 and D6. Edgar scored a touchdown in the first quarter, 6-0. St. Mary’s Springs scored a field goal before half to make it 6-3. That was the final as the second half was a slugfest. In the concourse, I found somebody had dropped a St. Mary’s Springs towel. Other than programs and the badly torn ticket stub was my only souvenir. The weather was getting cold and the sun was going down. An outdoor stadium in Wisconsin does get quite cold when the wind blows in. This game started low scoring, as it was tied 3-3 at the half. Then Brillion started to pull away, before winning it 31-10. At halftime, I was more worried about my extremities than a one-sided game. It was tough. I bought a hat from vendor outside (making the transaction through the metal fence) as I had somehow lost my hat and my ear were frigid. But, with nightfall upon me, we were onto game #4. Brodhead/Juda, I found out, was a cooperative agreement between the two schools. Something I found out was common in Minnesota and Wisconsin. Rather than competing individually, they join together to play as one team. It was odd seeing Brodhead fans and Juda fans cheering for the teams and hardly any calling them by anything other than the high school they were from. Shirts said Brodhead or Juda only. Only a few referenced “Brodhead/Juda” and those felt like they ‘were required to say it’. The Kewaunee Storm wore Vikings colors. Purple helmet, purple jersey, gold pants and white numbers. The Brodhead/Juda Cardinals looked like Louisville. White helmets, white jerseys and black pants. Red numbers and red striping/accents. It was 14-14 at the half, and Kewaunee led 28-21 after three. The fourth quarter was a route, as Brodhead/Juda just couldn’t hold on any longer. Two more touchdowns and the Storm of Kewaunee won 41-21. It was a fun, cold day. The stadium is smack in the middle of campus with limited to non-existent surrounding parking. The arena on the southeast edge of town (and I assumed by the surroundings home of the state fair) was the only parking. The stadium is nice, but ill-concieved. You could feel that the expansions of the stadium were more by ability, rather than design. It felt like the Herbie kickoff in Ohio Stadium. Gigantic stadium with tons of room to find a good seat and not be cramped. Yet, miraculously every time I sat down anywhere on the home side somebody would get the bright idea to sit right behind me or right in front of me. Despite the fact there was nobody to the right or left of them in their row. They insisted, it seemed, on being right there on top of me. Most of the first three games I sat in the endzone away from the scoreboard up high to get a good view free of other patrons. The stadium was roped off about two-thirds up the lower bowl. The scoreboard endzone side was roped off at about the 20, closing the entire endzone off. The opposite side was open to the top. The upper level on the south sideline was completely closed off. Wisconsin has the same cushioned seats that Ohio Stadium is getting. If the ticket holder pays extra, the school installed a cushioned seat with a backrest. But, only about a third the seats have them. Now, for other odds and ends. Camp Randall Stadium wasn’t the best place to watch a game. Sure, the sightlines were good and the field was close. But the stadium is very cramped for even the few people that were in attendance. Which brings me to the next problem. Unlike Minnesota, as I found out, Wisconsin has no standard way to really move the fans around the stadium for the games. It becomes a big mess of humanity that moves in and out of sections and there’s little cohesion to the seating arrangements. The stadium itself is like any other non-high school stadium. Expensive food. The bratwurst for $4 was the best buy. In fact, other than the hot dog, it was the only buy. Pretzels and hotdogs were $4. Water was $3 or $4 (can’t remember). Hot chocolate was $4 (again, was too cold to remember). The pitfalls of an outdoor game in a huge stadium with little recourse to fight the wind. it was fun. But, it was over. Now, on the shuttle back to my rental car, I had over 270 miles to drive. That wouldn’t be so bad if it weren’t for the fact it was less than ten hours until kickoff of the next game. I stopped at Walmart in Madison. It was the first ever two-story walmart I had seen. You park on the lower level in a parking garage under the merchandise level of the store. There was an interesting escalator design used to bring the carts up and down for you. I then drove northwest until i got tired. About an hour later, I stopped at a Petro truck stop, bought gas, used the bathroom and went to the car to sleep. Being that I tend to be cheap when it comes to hotels, I prefer to sleep in a car. It was only in the 20s, so with the two blankets I brought I slept comfortably for the four hours or so. I woke up just before 4AM and started my drive to Minneapolis. I had four hours to go the remaining 200 or so miles to get to the Metrodome by kickoff. I was certain I would miss the start of the game. Getting off I-94 in downtown Minneapolis to the Metrodome exit, I went west along the southside of the stadium and to Park Ave and, coincidentally enough, parked at the garage just west of the stadium for $5. The same price I had paid in Wisconsin and required a shuttle across the Himalayas, and here I only had to walk all of 500 feet to get to the main gate of the aging giant. The ticket was $12 for the all-day pass and you were allowed in-out privileges. By the time I had got in, bought a program, and walked to the first portal to the seating bowl I could, I realized it was already end of the first quarter. This would be my first ever non-eleven man high school game. I was on the Lanesboro side, and coincidently wore their orange (thanks to my Browns jacket) and cheered them on. Two small teams playing against eachother was a thrill. The stadium, thanks to the hefty dome, was loud for such small crowds. Goodridge/Grygla-Gatzke is a cooperative team of Goodridge and Grygla-Gatzke, which is a combined high school. For all that, they still can only manage to play at the 9-man level. Lanesboro looked like Massillon, white helmets, white jerseys, and black pants. Orange stripes, logos, and black numbers. G/G-G (as the scoreboard showed) wore all blue. The Burros of Lanesboro and the Wildcats of Goodridge/Grygla-Gatzke. After watching a few minutes, the lack of four players isn’t noticeable. What is noticeable is the yellow line running about 18 feet inside the sideline that acts as the 9-man sideline. Your eyes keep thinking there’s much more room than there is, even with all the players and coaches standing on what would be the field of play in any other game. After a scoreless first quarter, I watched an explosion of points as Lanesboro took a 20-14 lead into halftime. Trading scores in the third quarter, G/G-G finally tied it at 26-26 in the fourth quarter. After failing the two-point conversion, Lanesboro had an 8-yard run for a TD and converted a two-yard run to make it 34-26. G/G-G was stopped on 4th and 2. With the ball one last time, G/G-G had a 4th and 5 at the Lanesboro 12. A penalty pushed it back to 4th and 10 at the Lanesboro 17. An incompletion into the endzone with 43 seconds left ended it. Lanesboro moves on to the title game next week. Lanesboro 34, Goodridge/Grygla-Gatzke 26. The Goodhue Wildcats wore black helmets, black jerseys, and black pants with white numbers. The Barnesville Trojans worse white jerseys, and white helmets. Purple pants, numbers, and side panels. This game wasn’t close. Barnesville ran away with despite the final score, 49-30. During the game, I left and went next door to Hubert’s Sports Bar and got some food and drink. In In the early fourth quarter I returned to see a high-scoring but already decided outcome. The Fighting Pizza Rolls of Totino-Grace (as I referred to them) came in as a previous multi-championship team. St. Thomas came in as the private school that was favored. This was one of the best games. The Totino-Grace Eagles wore all navy with yellow stripes, numbers, and decals. St. Thomas Academy worse all white with blue trim, numbers, and decals. At halftime, St. Thomas held a slim 14-7 lead. Totino-Grace tied it at 14 in the third quarter, only to give the game back up to St. Thomas on a 4-yard scramble on third down, 21-14. After a long pass, Totino-Grace got a 1-yard touchdown run and followed it up with a third down touchdown pass to take a 28-21 lead. On 4th-and-17 with 25 seconds left, St. Thomas converted with a 22-yard pass to the ten yard line. On second down and goal, Totino-Grace sacked the St. Thomas Academy QB, he fumbled, and was recovered by St. Thomas Academy. With the clock ticking, they couldn’t set to run another play. Game over. Totino-Grace 28, St. Thomas Academy 21. I sat on the Albany side for this game. It was close early on, but became one-sided. The Rochester Lourdes Eagles wore dark helmets, white jerseys, and white pants. The Albany Huskies worse white helmets, purple jerseys, and white pants. Very similar to Penn State if they wore purple. After an early 7-7 tie, Rochester Lourdes crept out in front and it didn’t get challenged, 22-7 late. Ottertail Central was another co-operative team. This one was made up of several different schools in the area and didn’t try to hyphenate or stack the school names together. They simply chose an entirely new name for the football team and settled on the Ottertail Central Bulldogs. The Bulldogs wore white helmets, black jerseys, and black pants. They had white numbers with no trim. Their helmets had a dark logo I couldn’t make out. The Caledonia Warriors wore gold helmets, gold pants, and white jerseys (similar to Notre Dame) with dark numbers. this game was a huge mis-match. After a scoreless first quarter, Caledonia racked up 34 second quarter points to demoralize even the most optimistic fan. Two more touchdowns in the third made it a ridiculous 48-7 after Ottertail scored an early short pass in the third quarter. One more score in the fourth quarter stopped the suffering, and finished Caledonia, 55-7. The last game of the day was the big schools. I sat on the Brainerd side and again felt like bad luck. The Brainerd Warriors were dressed like Air Force, while the Rosemount Irish were dressed like Michigan with the Princeton winged helmet. After the start of the game, the announcer stated there were over 18,000 in attendance for the six games. Which averages to just over 2,000 per game. Most of those were the 4A and 5A games. Although the final was 28-14 in favor of the Irish, this game really wasn’t close. 28-0 in the fourth, Brainerd started to make a comeback but it was much too late. After the game, i returned to my car and paid my parking. I drove south out of town to find a place to park. 20 miles south of town, I stopped at a truck stop and got a shower, some cheaper non-stadium food and went to sleep. After getting out of the stadium around 11pm, it was only 9 hours until kickoff of the next game on Saturday morning. After sleeping about six hours in the car, I woke up and started driving back into town. After arriving a few minutes after kickoff (notice the trend? ), I sat on the Underwood side. Again, clad in Orange, I felt obligated. The Underwood Rockets wore black helmets, white jerseys, and black pants. Orange numbers and accents gave them a sharp look. The Cromwell Cardinals worse white helmets, red jerseys and black pants with white numbers akin to Louisville. This was a fun, close competitive game. Cromwell was the prohibitive favorite (despite their record) as they had been championship material several times before. Tied, 0-0 at the half, Underwood finally broke through with a long drive culminating in a one-yard run to make it 6-0. Early in the fourth quarter, Underwood scored on a 55-yard pass to make it 12-0. It was now to hang on as they had awoken the sleeping giant. Cromwell scored quickly on a 40-yard touchdown pass, 12-6. After converting a third-and-very-long, Cromwell scored again late to make it 12-12. Missing the point-after, Underwood had the ball and their offense had grown afraid to make mistakes. Forced to punt, Cromwell got the ball on a short 50-yard field. With 55 seconds left, Cromwell broke the hearts of Rockets fans, as they scored 10-yard run right after a 40-yard run. Another failed conversion, and it was 18-12. Underwood was desperate and their offense woke up as they had nothing to lose. After the kickoff, Underwood had 59 yards to go with 55 seconds left. A 31-yard pass set up a first and 10 at the Cromwell 28. An 8-yard pass setup 2nd and 2 at the 20. The QB ran out of bounds for ten and got a half-the-distance penalty on a late hit to the Cromwell four. A just missed incompletion setup 2nd and goal at the 4. After a third down play, one second was put back on the clock. Fourth down at the 3-yd line. One second left. Underwood threw to the endzone to an open receiver who… dropped the pass. Game over. Cromwell won. Underwood was agonizingly close. Cromwell 18, Underwood 12. The Minneota Vikings (no ‘s’ in the city’s name) wore yellow helmet and pants and a blue jersey. The New Ulm Cathedral Greyhounds wore white helmet and jersey with maroon pants. They had a maroon ‘dashing Greyhound’ on the logo, akin to the coachline’s logo. At halftime, Minneota led 20-14. By the start of the fourth quarter, Minneota held a 33-20 lead. Early in the fourth, Cathedral scored on a 4-yd touchdown run. They were tackled for a loss on the point after to trail 33-26. Minneota’s ensuing drive ended on a jump-ball interception to the Cathedral 26 yard line. On the ensuing drive, Cathedral converted a fourth-and-two and then struck with a 23-yard touchdown pass. Again, going for two, they converted the pass to take a 34-33 lead. Minneota was stopped on 4th-and-11 with :58 left. Cathedral, though, was stopped on 4th-and-inches to give Minneota one last desperate attempt. Three straight incompletions setup a fourth down final play from 79 yards away. The screen pass was complete, however the player had no concept to even attempt a lateral and simply lowered his head and went down on contact. New Ulm Cathedral 34, Minneota 33. The Rogers Royals had a really vibrant dark blue helmet, side panels, numbers, and stripes. The rest was black. The Mahtomedi (Maw-tah-mee-die) Zephyrs had black helmets and pants and a white jersey. Yellow stripes, “M” logo on the helmet, and black-out-lined yellow numbers. After the end of the 1A game, I went across the street again for lunch. This time, I was smart enough to wait for the 4A crowd showing up early to get out of the bar and into the stadium before trying to go over there. I missed the first quarter for a bucket of mini-burgers that were really good. Much better than the full-size burger I had the day before. Rogers was up 14-7 when I reentered the stadium. Seconds after arriving, Rogers scored again to make it 21-7. After a Mahtomedi touchdown, Rogers worked their way down the field quickly on a 38-yd pass and a 10-yd run to setup an easy touchdown, 28-13. Mahtomedi threw a late interception that Mahtomedi turned into a field goal to go into halftime, 31-13. After an early Mahtomedi touchdown, Rogers pulled away, winning 45-28. This was a matchup of two Catholic schools. For 3A, this was one of the lowest attended games when just trying to factor the fans wearing the colors of the teams playing. The rest seemed to either be early arrivers for later games or those hanging around a bit from the 4A game which had one of the largest crowds of the weekend. The Holy Family Fire (quite the odd name) wore dark green helmets and jerseys with black pants. With white numbers of logos. The DeLaSalle Islanders had black helmets and pants with white jerseys. They had black numbers and side panels. Shortly after kickoff, I decided to go back to the car to sleep. I was dragging from three straight nights of little sleep. I came back in during the third quarter to see Holy Family were up 28-23 in what seemed like it was going to be a competitive game. Holy Family scored quickly after I returned to make it 35-23. There was a really bad injury to a Holy Family player that delayed the game for well over ten minutes with 5:20 left. After converting a 4th-and-9, DeLaSalle had their pass tipped and intercepted to essentially end the game. With seconds left, DeLaSalle had the ball and scored a touchdown. Taking time to run from the sideline with :02 left, the clock ran out as the officially finally signaled touchdown. They ruled the clock had run out. Holy Family 35, DeLaSalle 29. In the second-to-last game of the weekend, the Eden Valley-Watkins Eagles played the Triton Cobras. The Eagles wore silver helmets and pants with really dark blue jerseys with white numbers. The Cobras wore red helmets, white jerseys, and black pants with black numbers. On the second drive of the game, Triton scored on a 14-yd pass to go up 6-0. That score held up until halftime. A 39-yd pass in the fourth quarter put the Cobras up 12-0. Eden Valley-Watkins threw an interception. On their next possession, they had a 29-yard pass to the 1-yd line. After a one-yard run, the score was 12-6 following a missed kick. Eden Valley-Watkins got the ball back late, driving, before throwing an interception at the Triton 10-yard line. Triton 12, Eden Valley-Watkins 6. The Wayzata (Why-zah-tah) Trojans wore gold helmets and pants with blue jerseys. White numbers with no logo or striping. The team wore a Notre Dame/New Orleans-like gold, while all their fans wore bright yellow shirts, hats, etc. Definitely an odd look. The Mounds View Mustangs wore all white uniforms with green helmets. They had green numbers and stripes with a white logo on the helmet. Early on, Wayzata returned an interception for a touchdown to go up 7-0. A 22-yd TD pass made it 14-0 going into halftime. Mounds View converted a fourth-down but threw an interception to thwart their drive. Mounds View then scored on a 3rd and 7 via a tipped pass caught be another Mounds View player in the endzone for a touchdown, 14-7. On Wayzata’s next drive, they were forced to punt. Mounds View blocked the kick into the endzone but couldn’t scramble fast enough before it went out of bounds for the safety, 14-9. After forcing a Mounds View punt, Wayzata got to work and simply forced their will on Mounds View. After a 62-yard run by the quarterback to the 11, Wayzata scored from the 2 on a 3rd-and-1 to go up 21-9. Mounds View had a reception broken up when the receiver got obliterated, flipping through the air into the ground. He laid there for quite a while being tended to. I was sitting in the west endzone watching the spectacle. This is when the game turned ugly and I stopped cheering for Wayzata. The Wayzata student section began a torrent of chants directed at the Mounds View fans, including “Why so quiet?” and “We can’t hear you” amongst others. This while the injured Mounds View player was lying motionless on the ground. Obviously, the mood turned very sour on the Mounds View side. I honestly have never seen that. Either the Wayzata side was completely oblivious to standard protocol and compassion when a player gets injured, or they simply didn’t care. Either way, it didn’t look good on their side. Three plays later, Mounds View scored an 8-yard pass on a beautiful one-handed basket catch on a fade route to make it 21-16. Mounds View was electrified, thanks to the earlier mentioned disrespect. Wayzata went three-and-out on the next drive, forcing a punt. The third down play was sheer fate. The Mustangs cornerback had fallen down on the play leaving the receiver wide open and had no one within twenty yards. The ball hit his ands and went right through. After the punt, Mounds View started at the Wayzata 42-yard line. A one-yard dump off made it 2nd-and-9 at the 41. A long incomplete over the middle. On 3rd down, a short ill-advised pass for three yards drained the clock and setup a 4th-and-7 at the Wayzata 39 with time running out. A long incompletion ended the game for Mounds View as the disrespectful Wayzata side cheered wildly. I’ve never been more disappointed to see a team I had no affiliation with lose. After the game, I returned to the parking garage. As I was leaving the stadium, the ushers advised us that it was very slippery out as it had rained lightly and then the temperature dropped. The entire walk back was an adventure of slipping and sliding across the roads and sidewalks. I had planned to drive south, but decided to go west out of the arena to avoid the heavy traffic. The roads were nearly impassable. I went west on I-94 at a brisk 10 mph. I-35E was a mess and required long waits as people slid out of control onto the shoulder or median. The entire 40-mile drive to a Walmart on the southeast side of the metroplex near a Buffalo Wild Wings took a staggering four hours. I had originally planned to take a scenic route through southeast Minnesota and Iowa back to Chicago. The plan was to watch the Browns game in Rochester, Minnesota about an hour-and-a-half south of Minneapolis. Turns out, I came nowhere close. I slept at the Walmart and drove over to the Buffalo Wild Wings in the morning. Alas, my Brownies lost a game they had no business losing. Now, back to the Metrodome. For playing 12 games over two days, the Minnesota State High School League really had this figured out. With the first game starting at 8am, 10:15am, 12:45pm, 3:15pm, 5:45pm, and 8:15pm. And they were very close to actually meeting those start times. And unlike Wisconsin, Minnesota figured out crowd control as well. After scheduling two early games small school games followed by the well attended 4A game. Following the 4A game, the level of the teams goes to 3A to 2A before the biggest crowd of the day with the 5A getting the best time slot. It was quick and seamless. Little confusion. The announcers updated everyone if they were arriving for a later game to sit away from midfield until the previous game had ended. And for the most part the fans complied unequivocally. A few showed up and tried sitting in a middle section when it wasn’t their game but with the entire lower bowl open, their was plenty of seating. Now, to the Metrodome itself. It’s a nice older stadium. It seems very small for an NFL venue. There is only two levels of seating with the pressbox/suites in the middle. It reminded me a lot of the Alamadome in San Antonio when I saw the UIL 5A titles there last year. A relatively plain-jane stadium. The concourses are vibrant, though as floor to ceiling murals and historical factoids and photos are everywhere. Including the “Ring of Champions” that encircles the entire lower concourse around the ceiling on the inner side of the concourse. It listed every champion of football and soccer that was won in the MSHSL, I assume, since they started playing at Metrodome. So, with the games next week, their names and scores of the games will be put up with the rest. Definitely a noteworthy prize for winning the state title (or even making the game as you’re still immortalized on the ring of champions banner. For the weekend, I spent about $400 between the rental car ($122), gas (about $100), tickets ($8, $12, and $12), programs ($3 and $5) and food and tolls (the rest). Stadium food for three full days is expensive. Even Hubert’s was expensive, but you got a lot for your money. For sixteen games in three days, it was a blast. I will try and do something like this again next year. 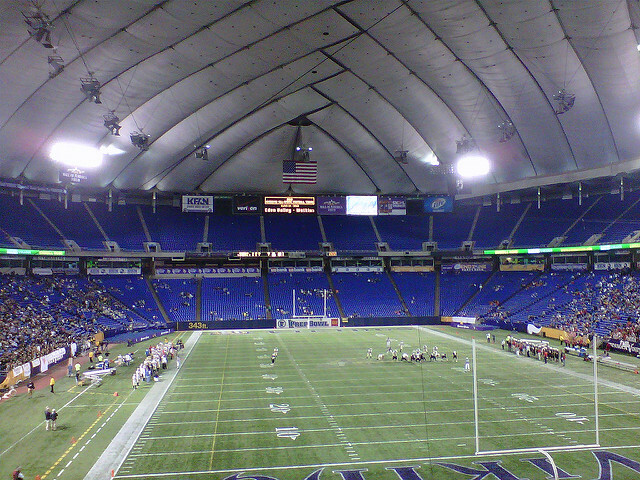 The Metrodome is a great place, though, to watch a game. Sitting inside in 60 degree weather when it’s 20 degrees outside is great. The echoing force of the spectators makes the game seem so much more engaging than an open air stadium in the wind losing all the vocal support. And the fluidity of the teams from one game to the next. A ten-minute intermission between games and the next one was kicking off. There was never a major pause in the action. If anybody ever has the opportunity, it is fun to catch the state semifinals in Minneapolis. Now, onto the games around the country. Most of the teams from around the country I saw have concluded their seasons. The only team still alive is Meridian (MS) who played Gulfport and won, 37-7. That sets up a state semifinal matchup with Oak Grove. The winner will probably play national power South Panola in the championship barring an upset. 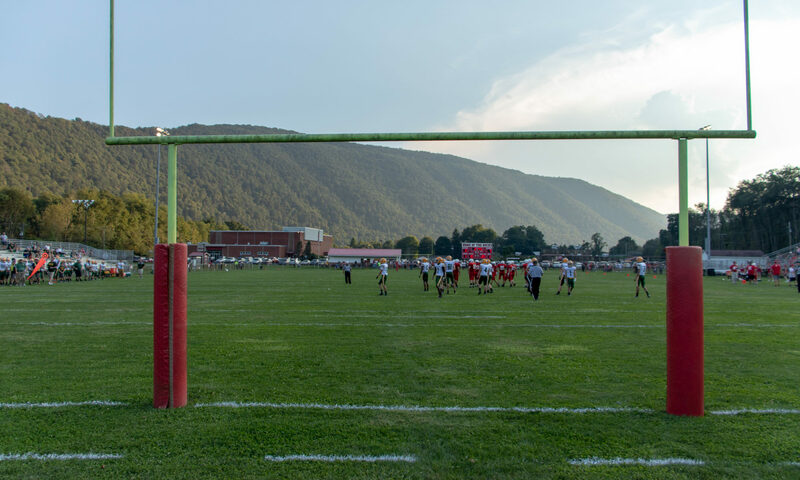 Pennsylvania – District play is still underway this past week and this upcoming week is the District finals in most districts. Their championship games are December 17th and 18th. Iowa – As I mentioned in weeks past, Iowa play the bulk of their playoff games at the UNI-Dome in Cedar Falls (not Cedar Rapids), Iowa. Nebraska – The state championships are held in Lincoln at the Memorial Stadium on Monday and Tuesday to go along with the rest of their oddly chosen playoff date choices. And yes, those are two schools from the same town playing for the large title. South Carolina – South Carolina plays their title games over the next two weekends. Class A Division I and Class A Division II play at Benedict College in Columbia on the 26th. The 2A, 3A, 4AD1 and 4AD2 titles are played at Williams-Brice Stadium in Columbia. California – The Southern Section (where the team I saw played) is still well in their playoffs with three rounds to go. The section finals are the weekend of December 10th. There’s way too many schools to document their playoffs just yet. Texas – The remaining team I’ve seen was White Deer in 1A-D2. After receiving the bye in the first round, they fell 32-18. This week is the Quarterfinal round for Six-Man Division I, Six-Man Division II, and 3A Division I. The rest are in the round of sixteen going into this weekend. After seeing sixteen games this past weekend. I’m taking it slow and only seeing five high school games and one Browns game this weekend. First up is the Shadyside-Mogadore game here in Steubenville on Friday night. On Saturday, I’ll be in Pittsburgh at Heinz Field for the four WPIAL championship games. Sunday morning, I’m taking my father to the Browns-Panthers game. Even after living in the Pittsburgh suburbs for three years at one point, this will be my first WPIAL championship weekend at either Heinz Field or Three Rivers Stadium. The games should be fun. And then next week, it’s the OHSAA Championship Games in Massillon and Canton next week. Should be a great finish to the season. After that, I’d like to see either the California, Texas, or Florida title games. But, time will tell on those ones.